Hi everybody! Today’s post is geared toward my friends in the query trenches, or my friends who are eyeing the query trenches from afar, or my friends who have fallen into a query trench and are now floundering with no direction and no idea which way is up. 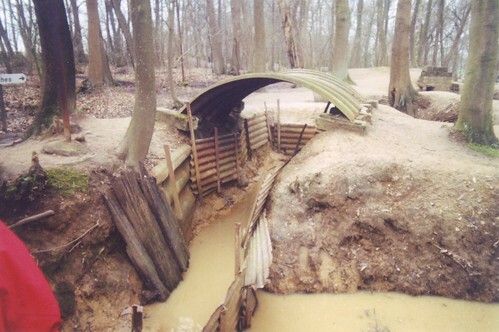 Why’s it gotta be so muddy in those trenches? So basically, if the idea of querying agents is anywhere on your radar, this post is for you. But first, a little background for those of you who may not know me very well. My query history: I’ve been in the trenches twice. The first time was December 2008–January 2009; the second time was October 2011–May 2012. I signed with an agent both times (lost my first one due to unforeseen circumstances with her agency) and learned a lot along the way. My first query experience was quick and relatively painless. However, my query letter was absolutely terrifyingly bad and I really just can’t let you read it because OMG. But, somehow, it did get me the attention I needed and I snagged Alanna Ramirez at Trident Media Group. My second query experience was 1) unexpected and 2) much longer than the first time around. However, this may be due to the fact that I did A LOT more research and chose my agents MUCH more carefully. So I just sort of took longer to do my end of the work, which I guess resulted in EVERYTHING taking longer. After I signed with Agent Emma, I posted a breakdown of my second trip into the query trenches. If you’d like to see the details of that experience, plus some snippets of my rejection letters, you can find it all HERE. Agent Emma has given me her blessing to post my query letter here on the blog, so without further ado, I give you my query letter for PULL. I was represented by Alanna Ramirez of Trident Media Group from January 2009 to September 2011. Now that she’s no longer at Trident, I’m looking for a new agent. I’ve heard great things about you, and after reading the interview you gave on Rebecca Taylor’s blog, I’m confident that we would make a good team! I hope you will consider PULL, my YA novel with supernatural and paranormal elements. The manuscript is complete at 74,000 words. When Rosie Clayton and her family relocate to London for the summer, it’s anything but a vacation. Her grandfather is dying of cancer, and her brother—who struggles with substance abuse—is going through a reform program. There’s not much for Rosie to do except help Nana around the house. But on their first night in the village of Blackheath, Rosie sees a girl get mugged. As she tries to help, a terrible imploding sensation overtakes her. She falls to the ground, overwhelmed by a deafening noise and a dizzying blur of colors. It’s over in a flash of light, and somehow, the scene has rewound itself. The crime unfolds again, exactly as it did before—except this time, a mysterious guy intervenes and changes the outcome. Albert is tall and strong, and judging from the way he handles the muggers, he’s accustomed to fighting. Admitting that she saw two endings to the same event seems insane, but Rosie can’t deny Albert’s existence for long—especially when he uses his ability to manipulate time, called “Pulling,” to save her life. When evil beings known as Mortiferi start to hunt Rosie, she turns to Albert for help—but with all the secrets he carries, can he be trusted? Working with him is her only option when the Mortiferi take her brother hostage. Drawing from a reservoir of courage she didn’t know she had, Rosie vows to save her brother’s life—even if it requires sacrificing her own. I am a high school Spanish teacher by day, young adult author by late afternoon, and wife/mother by evening. I run a blog at www.annerileybooks.com, I have an author Facebook page, and I am active on Twitter @AnneRiley. I’ve spoken locally to groups of writers, been interviewed on Daytime Alabama (a local news program), and participated in Decatur Book Festival as an emerging author. I’m also the founder of Magic City Literati, a community of fiction writers in my hometown of Birmingham, Alabama. I am querying other agents, and several are currently considering the manuscript. In accordance with your submission guidelines, I have pasted a synopsis of PULL below. Thank you for your time, and I look forward to hearing from you! And then obviously I pasted the synopsis into the body of the email and hit SEND. …sent me a rejection letter that was so complimentary, I had to read it twice to make sure she was rejecting me. It seemed like the agents were all kind of saying the same thing as far as what needed improvement, so I stopped querying, did some revisions, sent it out to a few more beta readers, and then started planning my next round of queries. But it wasn’t until I joined an #askagent session on Twitter that I discovered a very important little nugget of information: sometimes, you can query the same agent with the same manuscript again–even after they have rejected it. 1) The agent must have previously requested the full manuscript from you. 2) It helps if you feel like they genuinely liked it and were on the fence about whether to reject you or not. If their rejection was super complimentary and full of good suggestions for improvement, they probably liked it a whole lot but just couldn’t make the commitment to signing you on for whatever reason. 3) You must have made substantial revisions, preferably based on the feedback of other agents (especially the agent you are re-querying). If you can say, “Several agents suggested that the manuscript might benefit from changing X, Y, and Z, and you encouraged me to add in the elements of A and B. I have made these changes, combed through the manuscript for additional improvements, and feel that my work now shines even brighter than before.” Or something along those lines. So how do you approach an agent who’s already rejected your work and ask if they want to see it again? Well, I did it like this. In the months since you read my YA novel, PULL, I’ve received specific feedback from several other agents. One agent suggested I rework the beginning to intensify the family dynamic, another asked for more processing time between action scenes, and a third advised me to amp up the romance factor earlier in the story. In addition to addressing these issues, I’ve also tightened up the writing and made substantial revisions to the entire plot. Even though you graciously passed on the original manuscript, I wondered if you might like to see the new version. I wouldn’t have thought to ask except that the other day, while participating in an #askagent session on Twitter, several agents said they would want another look at a novel they’d passed on if it had been heavily revised. I know how busy you are, so I will completely understand if you decline to see PULL again. However, I will be sending it out to a new round of agents soon and wanted to give you the opportunity to have a second look. I’ve worked hard to make it shine, and I’m excited about the improvements! Please let me know if you’d like to see the revised PULL and I’ll send it your way. I would still be thrilled to work with you! What happened next? She DID want to see it again (actually, four of the five agents I re-queried wanted another look). And she liked my revisions so much, SHE OFFERED REP! So, in summary, here’s what I learned the second time I found myself hunkered down in the query trenches. 1) Have beta readers for your query letter. Several of them. Preferably people who have queried and have agents, but anyone will do if they are a good writer and know what a query should contain. 3) Pay attention to the feedback you get from your fulls. Are they all saying the same thing? Did any of the agents seem particularly close to offering rep? Next week I’m planning to do a post about the top five agents I would query if I were querying again. Hope to see you back here then! Anne, thank you so much! This is exactly where I am right now – hearing “send me future work” or “maybe change XYZ” and I feel a little lost. But now I think I have a plan. And I love Jenny Bent. She is stone cold awesome and helpful. Oh, I’m SO glad this was helpful to you. Good luck! And yes, isn’t JB the bomb? How helpful this will be for people, Anne! When I was getting ready to query, I really found that looking at actual queries that worked was one of the most helpful things when it came to crafting my own query. I’m hoping it is helpful for people! Thank you so much for this! I definitely have benefited! I also got an agent to say they would love to see my future work after they rejected me. I can’t wait to see what you have in store for us! Agent Emma sounds like the coolest!! This is so helpful, Anne! The specifics of your story give context to your advice and make this priceless. I’ll be back in the future if I find myself in this position. I’m still in the rewrite-after-detailed-rejection-feedback stage. Now that my baby is seven months old, I’m ready to get out of that stage once and for all.